First Death Confirmed From Colorado Springs Wildfire : The Two-Way That grim news comes as firefighters report progress in battling the flames, and as the weather forecast bodes well for making more gains today. President Obama is visiting the area today. 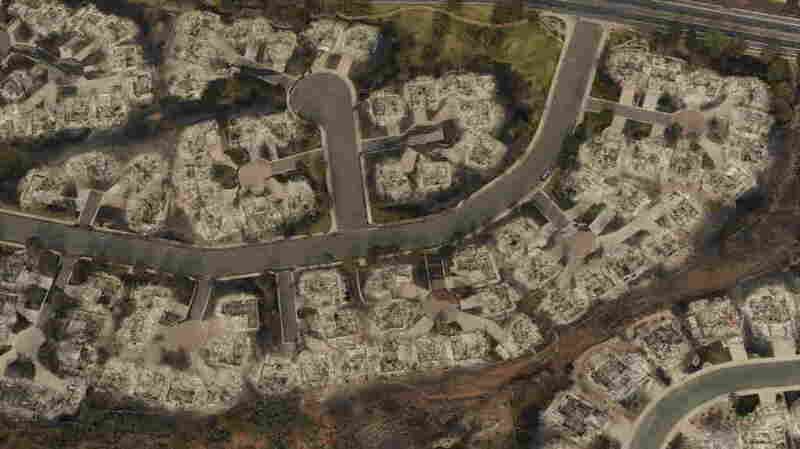 This aerial photo taken Thursday shows the destructive path of the Waldo Canyon fire in the Mountain Shadows subdivision area of Colorado Springs, Colo. Though there's been welcome news about progress in fighting the wildfire that has now destroyed about 350 homes in and around Colorado Springs, Colo., there's also the sad news that at least one person has died. "The roaring Waldo Canyon fire that exploded into west-side neighborhoods of Colorado Springs destroyed 346 homes — making it the most destructive wildfire in state history. It also has claimed at least one life." Colorado Springs' The Gazette says a second resident of the same home where the body was found is missing. And, "Colorado Springs Police Chief Pete Carey said fewer than 10 people were unaccounted for in the areas that were hit by explosive flames on Tuesday afternoon." On Morning Edition, NPR's Jeff Brady reported that the search for those who are unaccounted for has been delayed "because it's been too dangerous for crews to be in the area." Today, President Obama is scheduled to visit the area. He has declared "a major disaster" exists in the state, which puts in motion more federal aid for those affected by the fires. The Gazette says there's reason to hope for more progress on fighting the fires: "Calmer winds — in the neighborhood of 10 mph — and relative humidities of 10 to 15 percent were forecast for Friday, offering firefighters more hope that Friday would bring further gains on the fire lines." According to the InciWeb interagency clearinghouse, nearly 17,000 acres have now been burned by the Waldo Canyon fire and it's about 15 percent contained. Officials don't expect to have it totally contained until July 16. But, some residents are being allowed to return to their neighborhoods to assess the damage to their homes. Update at 2:30 p.m. ET: Neighbors of the couple who lived in the home where the body was found say the husband and wife haven't been seen or heard from since Tuesday, The Denver Post reports. Meanwhile, the Gazette reports that Air Force One has landed in Colorado Springs.